The first ever motion picture created was of a running horse. Looking back, the film industry has come a long way since then. From the insanity of Black Swan, to the heart-stopping (and sometimes, gory) action of Django Unchained, the film industry has captured millions of hearts and minds with its magical way of drawing you into a whole other world, before launching you (cruelly) back into reality. 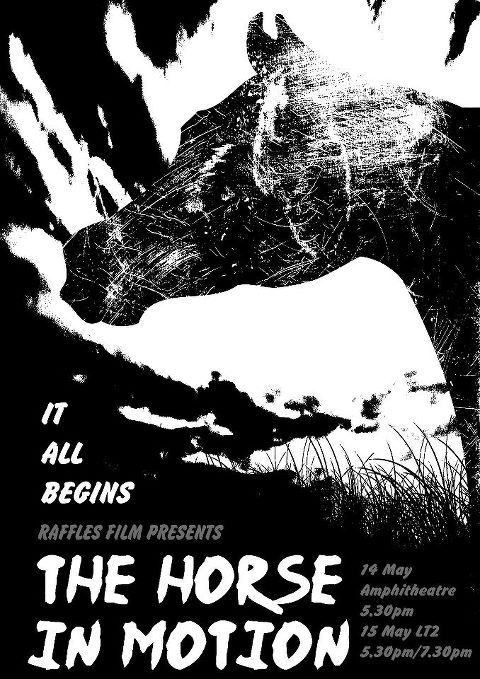 In somewhat similar fashion, Raffles Film Society documented their first forays into filmmaking in a half-hour showcase aptly named, “The Horse In Motion”. The showcase opened with Knock, a chilling take on urban legends. Knock features a student studying late into the night, the ticking clock his soundtrack and books, his companion. Suddenly, a strange knocking interrupts his thoughts. Curious, he gets up to investigate. As he makes his way down a red-tinged hall, and opens the main door, he finds nothing. Perplexed, he resigns himself to returning to studying. However, the knocking persists and the story’s true climax comes with a shocking revelation. The film oscillated between climaxing and sliding into a resolution… Or so we thought. It maintained a tight grip on building tension throughout, truly an excellent blend of spine-chilling music and suspense that kept us on the edge of our seats for its entire duration. Feng Weihan remarked, “I wanted to explore more mature themes”, when asked about why he chose to make a film on this topic. Unsurprisingly, this motion picture was indeed a reasonable exploration of more mature themes such as loss and memory. It was a breath of fresh air and was indeed pleasing to watch. The film begins with a newly-formed friendship between a boy and a girl, through studying sessions. As we all know, though not impossible, ‘just friends’ is hardly ever the case between members of opposite genders. As the film progresses, the girl begins to fall in love with the boy. In fear that her confession might affect their friendship, she holds back. Yet when she finally gathers up the courage to write a confession note, the boy has already gone off with someone else – as you would probably expect. She crumples up the note, throwing it away. The film then closes with the demolition of the tower built up throughout the film as their relationship grew, only to collapse in the end. The unusual title of this film caught our eye. It was directed and produced in a simple manner, telling the story of a “Mugger” being the ‘anomaly’ in his class of ‘bo-chups’ (loosely translated, a Hokkien phrase meaning “couldn’t care less”). He was always relegated to the side-lines, partly due to his ‘80s-influenced fashion sense with the ever-popular high-waisted pant. Nevertheless, this film had a happy ending with the “Mugger” finally ‘integrating’ with his classmates due to their shared dislike towards a particularly naggy teacher. The light-heartedness and relatability of the film through its depiction of school-life made it an enjoyable watch. A boy despairs over his inability to pass his 2.4km run. He is motivated to run with a girl he likes, inspired to run faster in her presence. Eventually, our hero finishes his 2.4km in a mere ten minutes, running across the bridge towards the girl, then revealed to be a figment of his imagination. Out of the blue, the boy poses with a bottle of F&N and appears to advertise it. This was an unexpected twist in the film, possibly meant to be a parody, definitely catching the audience by surprise. The final short film screened was a re-hash of the usual “student-drug-addict-meets-his-end-and-wishes-to-repent” plot, and predictably, it did mirror those “1800-X-AHLONG” commercials on television for the ‘redemption’ factor. Nevertheless, its fancy cinematography compensated for it being rather forgettable. It was indeed a powerful end to the string of 6 short films we were treated to. Some of the themes covered in the short films, such as the lack of social integration and relationship building, are popular topics students are able to relate to and empathise with. Such themes were accurately portrayed in the short films. Raffles Film also branched out and touched on delicate themes, such as unfaithful relationships, drug addiction, and even horror. It was an ambitious decision to direct and film such themes, but Raffles Film did an absolutely brilliant job in capturing the audience’s hearts. Viewers were kept engaged throughout each and every film by the carefully-selected music and entertaining dialogues. The impressive cinematography undoubtedly made the half hour worth our time, despite some of the plots being slightly clichéd. Whilst the audience turnout may have been less than ideal, the films screened were excellent first attempts and showed the tremendous hard work put in by the members to make this happen. 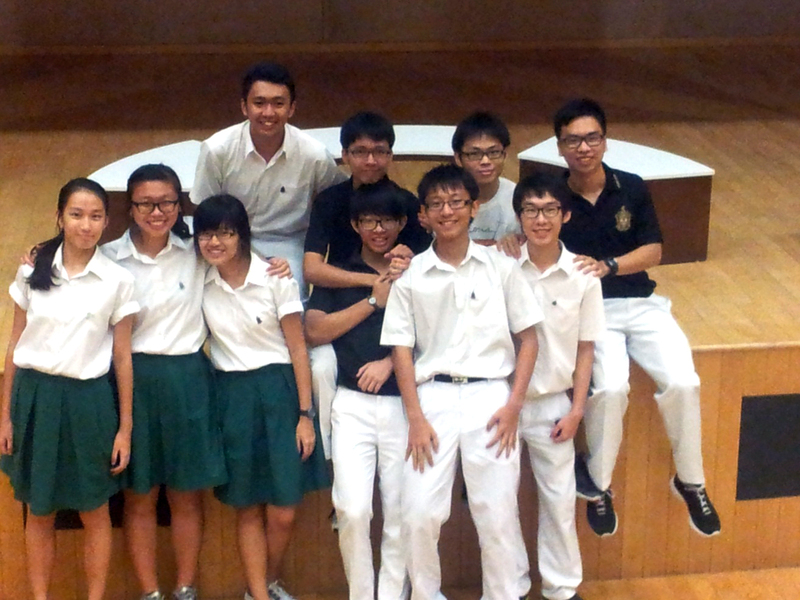 The production process was indeed a challenge posed to the members of Raffles Film. Year Fives were split into groups and tasked to write a script, only to swap scripts with each other after hours of fine-tuning. These films were largely completed over the span of two days – which included familiarizing themselves with new scripts, acting, and filming – and were wholly edited by Year Fives. Of course, the Year Sixes played a role in the production as well, producing films such as Trace. Under these circumstances, the showcase was indeed a commendable production. Wu Jiamin of 14S03S commented, “the films were not made with million-dollar budgets, but they were made with ‘million-dollar hearts.’” And yes – that is certainly good enough for us, even though the transparency of the themes did cast a shadow on the creative, eye-catching cinematography. Just as the film industry has matured into the multi-million dollar industry it is today, we must never forget that it all began with a running horse. In similar fashion, Raffles Film, guided by Mr Kelvin Sng, director of the locally-acclaimed movie, “Taxi! Taxi!”, has the potential to grow, and we definitely look forward to future productions from them.